m. MARTHA DODD m. 14 Dec. 1827 Brighton, Sussex, b. 1810. MARTHA AUGUSTA MERCER c. 1829 Brighton, Sussex, m. JOHN ROBINSON 28 May, 1848 b. 1827. JAMES MATTHEW MERCER c. 31 July, 1831? Brighton, Sussex. MARY NAOMI JANE MERCER c. 19 Feb. 1837 Brighton, Sussex. m. 2 SARAH EVELEIGH 1 Aug. 1868 b. 1828 Cullompton, Devon, d. 1893. EMMA MERCER b. 1841 Brighton, Sussex. JANE MERCER b. 1843 Brighton, Sussex. SARAH MERCER b. 1849 Brighton, Sussex. CHARLES MERCER Wheelwright b. 1853 Brighton, Sussex m. FRANCES JANE REEVES 11 May 1872 Brighton, Sussex. Children: CHARLES, KATE, HENRY, WILLIAM, VERNON and ALBERT. JAMES ISAAC MERCER b. 1855 Brighton, Sussex. JOHN JAMES HENRY WEST b. 1861 Brighton, Sussex, d. 1897. LYDIA RUTH WEST b. 1862 Brighton, Sussex, d. 1917 m. - HARRIS. ALICE JANE WEST b. 1864 Brighton, Sussex, d. 1945. HARRIET AGNES WEST b. 1868 Brighton, Sussex, d. 1896. RUTH CAROLINE WEST b. 1869 Brighton, Sussex, d. 1952 Philadelphia area, United States of America m. GEORGE GILBERT DAY b. United States of America. CHARLES ALFRED WEST b. 6 Nov. 1870 Brighton, Sussex, d. 22 Aug. 1955 Brighton, Sussex, m. BEATRICE BALDEY 5 Dec. 1897 Brighton, Sussex, b. 24 Nov. 1877 Fulking, Sussex, d. 19 Dec. 1957 Brighton, Sussex. CLARA HANNAH WEST b. 1874 Brighton, Sussex, d. 1898 Brighton, Sussex. CHARLES PERCY WEST b. 6 Nov. 1899? Brighton, Sussex, d. 31 Oct. 1979 Kingsteignton, Devon, m. (1) KATEY/KATE? Brighton, Sussex, d. 7 Jul. 1955 m. (2) GWEN? b. Birmingham district, Warwickshire. HARRY LIONEL WEST b. 11 Dec. 1900 Brighton, Sussex, d. 15 Mar. 1979 Bristol Avonmouth m. NELLIE CAROLINE PAGE 11 Jun. 1938 Prestonville, Brighton, Sussex b. 29 Oct. 1904 Shoreham, Sussex d. 26 Jun. 1971 Bristol, Avonmouth. KATHLEEN WEST b. 19 Dec. 1919 Brighton, Sussex, d. 19 Dec. 1996 Brighton, Sussex, m. JOSEPH ROBERT SAYERS 19 Jun. 1947 Brighton, Sussex b. 17 Sep. 1913 Brighton, Sussex. TREVOR JOHN JONES b. 18 Mar. 1950 Brighton, Sussex, m. DOREEN JOAN FORDHAM, b. 30 Oct. 1946 m. 27 Oct. 1973 Patcham, Sussex. GLEN PETER JONES b. 14 Jul. 1971 Werribee, Victoria, Australia m. TRUDI MARIE LAWFORD 25 Jan. 1997 Casterton, Victoria, Australia, b. 25 Oct. 1976 Casterton, Victoria, Australia. 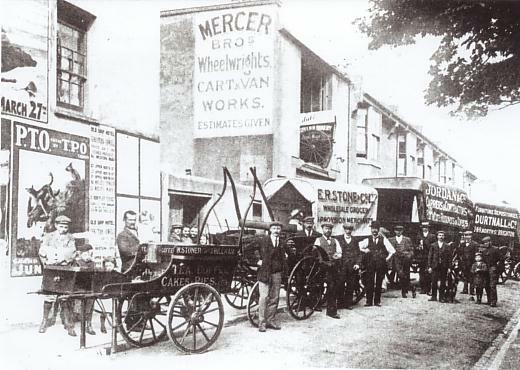 THE MERCER FAMILY - BRIGHTON COACH BUILDERS. James Mercer and Martha Dodd were married on 14 Dec. 1827 in Brighton, Sussex. When their eldest daughter Martha Augusta was born two (2) years later and baptised on 6 Sept. 1829 at St. Nicholas Church the family were living in Duke's Passage off Duke Street. However when their next daughter Elizabeth Sarah Mercer who was my maternal great-grandmother was born and baptised on 23 Jun. 1833 the family had moved to Thomas Street where they were still living when their third daughter Mary Naomi Jane was born and baptised on 19 Feb. 1837. 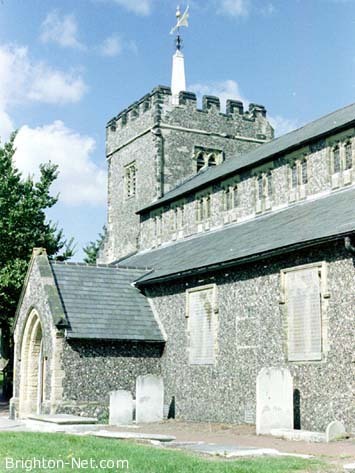 On 28 May 1848 Martha Augusta Mercer married John Robinson at St. Nicholas Church. At the time of the 1851 census John 24 a Grocer's Porter, Martha 21 and their children John 2 and Martha 2 months were living at 39 Kemp Street with her parents James Mercer 42 a Coach Builder and Martha Mercer 41 a Laundress and their remaining children Elizabeth 18 an Ironer, Mary 14, Henry 12, Emma 10, Jane 8, Ruth 6 and Sarah 2. It is reputed that the terraced houses in Kemp Street consisted of six (6) small rooms each being about 2.5 metres by 3 metres at the most which would have created cramped conditions for them all. The following year James and Martha's daughter Elizabeth Mercer 20 married John West 24 on 22 Aug. 1852 at St. Nicholas Church. Elizabeth was still living at 39 Kemp Street whilst John was living at 45 Kemp Street and was employed as a Watchman at the Railway. John would not have been living in Brighton very long as he was recorded in the 1851 census as living with his family in Henley Common, Fernhurst in the far north west of West Sussex. In the 1867 edition of Kelly's Post Office Directory of Essex, Hertfordshire, Middlesex, Kent, Surrey and Sussex James Mercer, Wheelwright was listed as running his Coach building business at 33 Queen's Gardens and 52 North Lane in Brighton. When James Mercer died in 1875 his widow Martha carried on with the Coach Building Business. At the time of the 1881 census Martha Mercer was visiting 62 Shaftsbury Road, Preston (Preston village now a suburb of Brighton) the home of her daughter Ruth Emily Jenkins 37 and her son-in-law Ebenezer Jenkins 37 a Bootmaker who was born in Loxwood? Sussex and their children Ada 5, Charles 3 and Martha 1, all born in Bedford, Bedfordshire. Aged 71 Martha Mercer's occupation was given as Coach Maker and Proprietor employing 7 men and 3 boys. Meanwhile the Robinson family who were living with James and Martha Mercer in 1851 were now living at 17 Jersey Street, Brighton. The family living at home consisted of John 54 a Coach Builder, Martha Augusta Robinson 51 and their children Henry 20 a Wheelwright, Frederick 14 a Telegraph Messenger and Arthur 7. Their eldest son John now married was living with his family and his in-laws at 24 Gardner Street, Brighton they were: John 32 an Upholsterer, Ellen 28 an Upholstress, their children John 6, Clara 4 and Albert 2 and his widowed mother-in-law Philadelphia Gosten 69 Upholstress and brother-in-law James Gosten 31 an Upholsterer. In 1881 Martha Mercer's eldest son Henry 42 a Wheelwright was living at 33 Stanley Road, Preston with his wife Sarah Mercer 52 who was born at Cullompton in Devonshire and their younger daughter Sarah 15. Her second son Charles Mercer 27 Wheelwright was living with his family at 11 Ann Street, Brighton. Martha's youngest son James T. Mercer 26 Coach Painter was living with his family at 25 Winchester Street, Brighton. The 1891 census shows that Henry was now a Coach Builder and that he, Sarah and their elder daughter Caroline 28 Domestic Servant were living in Stanley Road. Also found in the 1881 census were Mercers who may also be descendants of James and Martha Mercer. Charles Mercer 27 Wheelwright living with his family at 11 Ann Street, Brighton. James T. Mercers! 26 Coach Painter living with his family at 25 Winchester Street, Brighton. The local street directories for the 1880s and 1900s carried no advertisements for the Mercer's Coach Building Company but they did give several new business addresses. 1883 Mercer Coach Builders, 25 Spring Gardens, Brighton. J. Mercer, Coach Builders, 33 Sydney Street, Brighton. 1900 H.J. Mercer, Coach Builders, 43 North Road, Brighton. H.J. Mercer, Coach Builders, 38 Gloucester Road, Brighton. All these addresses were apparently just business addresses and the family lived elsewhere. The Brighton Museum has preserved in its entirity the Marshals Row Blacksmiths smithy (1830 - 1950) which would have had many of the Wheelwrights' tools and equipment. It is highly probable my Mercer ancestors functioned in a very similar environment. CARTS REQUIRING REPAIR AND REPAINTING OUTSIDE CHARLES AND JAMES MERCERS' WORKSHOP IN PROVIDENCE PLACE, BRIGHTON CIRCA 1910. Charles and James Mercer, Wheelwrights, the two youngest sons of James and Martha Mercer nee Dodd and youngest brothers of my great-grandmother Elizabeth Sarah West nee Mercer prospered in their cart repairing business during the years before the invention of the automobile. When the business closed down James Mercer went to work for the newly formed Southdown company. Charles' eldest child Charles James Mercer m. Ellen Slaughter 28 Aug. 1899 Brighton, Sussex and his profession was a Coach Builder. Where many of the Mercer family were baptized and married.